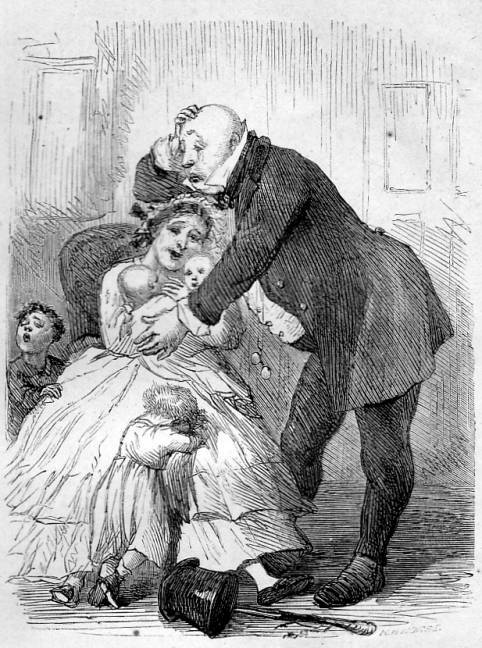 "Mr. Micawber and His Family" by Sol Eytinge, Jr.
Fifth full-page illustration for Dickens's David Copperfield in the Ticknor and Fields (Boston), 1867, Diamond Edition. "Emma, my angel!" cried Mr. Micawber, running into the room, "what is the matter?" "I will never desert you, Micawber!" she exclaimed. "My life!" said Mr. Micawber, taking her in his arms, "I am perfectly aware of it." "He is the parent of my children! He is the father of my twins! He is the husband of my affections!" cried Mrs. Micawber, struggling; "and I ne-ver — will desert Mr. Micawber!" Whereas Phiz's domestic scenes are packed with telling detail, Eytinge's focus on the characters and merely sketch in elements of background. Here, however, he includes those markers of Micawber's pretension to middle-class respectability, his top hat and cane (bottom) and his pince nez (so very fashionable in the London of the 1840s) hanging from his neck. Dickens, Charles. The Personal History of David Copperfield. Il. Sol Eytinge, Jr. The Diamond Edition. Boston: Ticknor & Fields, 1867.